When MIG welding consumables aren’t properly installed and maintained, it can result in wire feeding issues and weld quality problems. Troubleshooting and correcting these challenges can cost hundreds, if not thousands, of dollars in downtime and lost productivity in any manufacturing operation. These issues are particularly compounded as the industry faces a shortage of skilled welders because those entering the profession have less experience and may be more prone to installing MIG gun consumables and liners incorrectly. Consumables that simplify the installation process can help eliminate errors, reduce downtime for changeover and troubleshooting, and decrease costs. 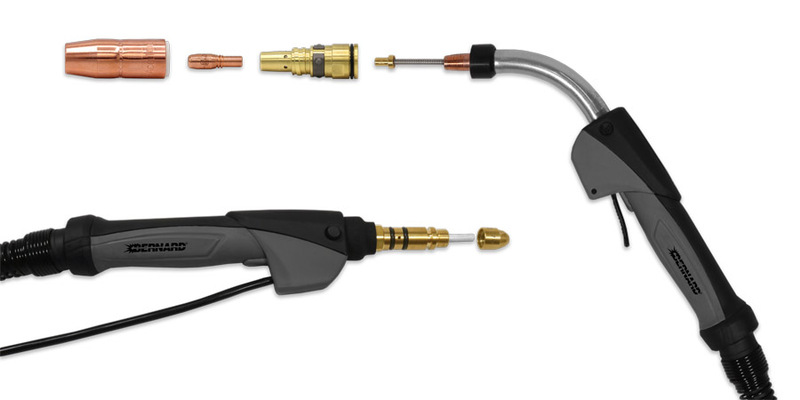 Fortunately, new MIG gun consumables are available in the marketplace that help address wire feeding problems and the role they play in maximizing throughput and productivity. Consumables, such as the ones found within the AccuLock S system, simplify the installation process and help eliminate errors, reduce downtime for changeover and troubleshooting, and decrease costs. When poor consumable performance isn’t addressed, it can result in, among other problems, lower quality parts and expensive rework. 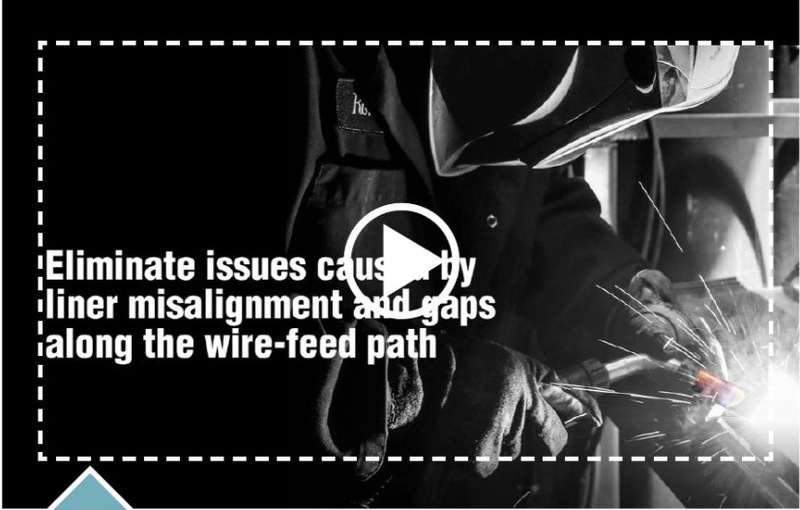 Some of the most common complaints in the welding industry are about wire feeding issues. Often, improper trimming or installation of the MIG gun liner is the cause of these feeding problems. As with other consumables, MIG gun liners can wear out over time and must be changed periodically. Unfortunately, replacement liners are often longer than necessary and must be precisely trimmed according to the style and length of the gun, which isn’t an easy task. Even if the liner is trimmed properly, in some cases, it is replaced in an incorrect fashion, which can create a host of problems. A liner that is cut too short can lead to issues that a lot of welders experience: wire chatter, erratic arc and burnback. A liner that is too long, which happens less frequently, results in a tight fit and can cause the wire to weave and curve as it feeds through the gun. If an operator continues to weld without diagnosing the cause of the problem, bad welds could require rework or result in scrap. Another common habit in the industry is welders changing contact tips at the first sign of trouble with the gun. While this may offer a short-term fix, if the liner is the root cause, the problem will repeat itself, leading the welder to use more tips than necessary. This increases costs due to wasted consumables and downtime for changeovers. In some operations, welders aren’t responsible for installing or trimming their own liners. Instead, they take their guns to the maintenance department whenever a liner must be changed. This adds downtime and costs and decreases throughput in the operation. Improper trimming or installation of the MIG gun liner is often the cause of wire feeding problems. AccuLock S series consumables, however, take the guesswork out of liner trimming and installation. To combat issues surrounding liner trim length errors and poor wire feeding, solutions such as AccuLock S series consumables from Bernard are available. By employing these solutions, welders can reduce troubleshooting, downtime and rework – ultimately saving substantial costs. The AccuLock S consumables take the guesswork out of liner trimming and installation in semi-automatic welding operations through an error-proof liner replacement process that eliminates measuring and incorrect trimming of liners. In contrast to most MIG gun liners that load from the back of the gun, AccuLock S liners load through the neck at the front of the gun. The liner is then locked and trimmed flush with the power pin at the back of the gun, which eliminates the need to measure. This also eliminates doubt about proper liner length – and the time spent troubleshooting liner trimming issues – because welders can simply look at the back end of the gun to see that the liner is correctly trimmed and in place. With traditional MIG guns, welders can’t see if a liner is cut too short because the end of the liner is hidden under the nozzle and gas diffuser. A welder would have to remove all of the consumables to see the liner inside the gun. In addition, the AccuLock S system optimizes wire feeding because the liner is locked and concentrically aligned to the contact tip and the power pin without the use of fasteners. Capturing the liner at both ends of the gun keeps it from extending and contracting based on gun position – and it allows for a flawless wire feeding path. Typically, the longer the welding gun, the more the cable bends and twists. Even when a traditional liner is perfectly cut and installed, the liner gets pushed forward and back inside the gun as it’s used because the liner is affixed at the back end of the gun but free floating at the front of the gun. This liner movement can result in wire chatter and erratic arc. When the liner is affixed at both ends of the gun, as with the AccuLock S system, welders are assured the liner won’t pull back or push into the contact tip, allowing for smooth, uninterrupted delivery of the wire to the weld pool. And, because the liner is concentrically aligned with the contact tip, it creates less mechanical wear on the tip’s interior diameter, possibly leading to longer life by reducing the risk of keyholing associated with misaligned liners and contact tips. Reducing keyholing also lessens the opportunity for erratic arc, excessive spatter and burnback, all issues that shorten tip life. 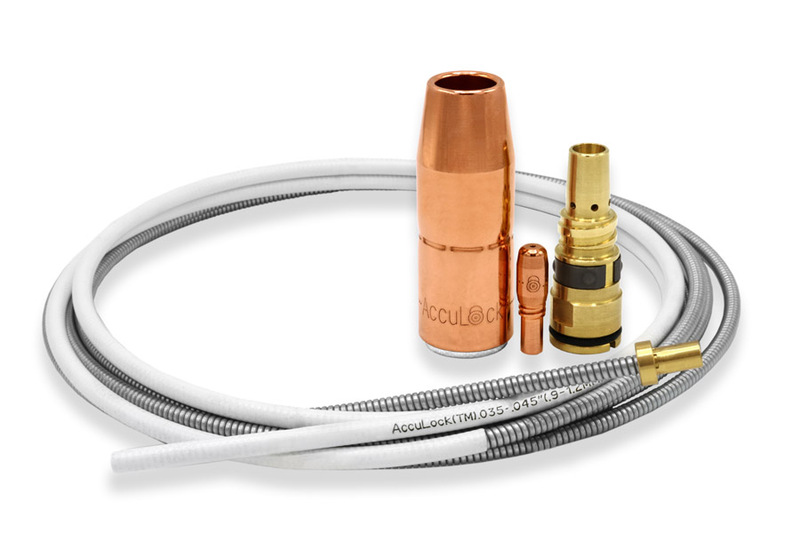 Cool, connected contact tip: Sixty percent of the AccuLock S contact tip is buried in the gas diffuser to protect it from heat damage. As the shielding gas flows through the gun, it cools the contact tip tail inside the gas diffuser, which helps reduce heat and wear. This differs from traditional tips that screw onto the gas diffuser with little to no portion of the tip exposed directly to the shielding gas as it exits the diffuser to the arc. A tapered design of the consumables tightly locks the conductive parts together to minimize electrical resistance and further reduce heat buildup. Versatile nozzle: A patent-pending design allows welders to choose a thread-on or slip-on nozzle – with the same nozzle part number. Typically, a nozzle is either thread-on or slip-on style, a choice that often comes down to welder preference. A thread-on nozzle is locked in while a slip-on nozzle can be adjusted to different heights and easily pulled off. With the new consumables, the same nozzle can be used as a slip-on or thread-on nozzle, and the change is determined by using a different diffuser. This allows operations to greatly simplify their consumable inventory and changeover with fewer parts to manage. In addition, a steel retaining ring and friction lock on the diffuser help prevent the nozzle from unthreading or loosening when it’s threaded on. This also helps eliminate the potential for gas leaks at the back of the nozzle or insufficient gas coverage of the weld – a common occurrence when traditional thread-on nozzles loosen over time. 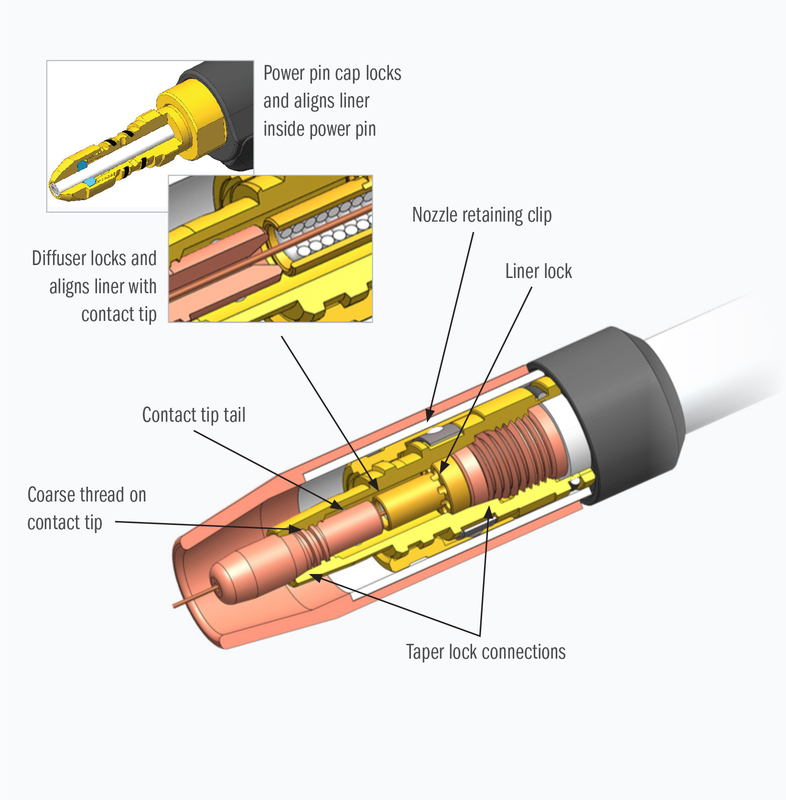 This cutaway shows the features of the AccuLock S series consumables. Coarse threads: AccuLock S contact tips feature coarse threads, making them less likely to become cross-threaded. They also require fewer turns to install or remove – speeding up tip replacement. One full turn disengages the tip from the diffuser. Significant time and money can be spent troubleshooting weld quality problems and wire feeding issues, such as erratic arc, birdnesting and burnback. Overall, AccuLock S series consumables are designed to reduce downtime, costs and rework – maximizing throughput and efficiency. As many operations are dealing with increasing welder retirements and turnover, any reductions in troubleshooting time associated with less experienced welders installing consumables can be a big benefit.